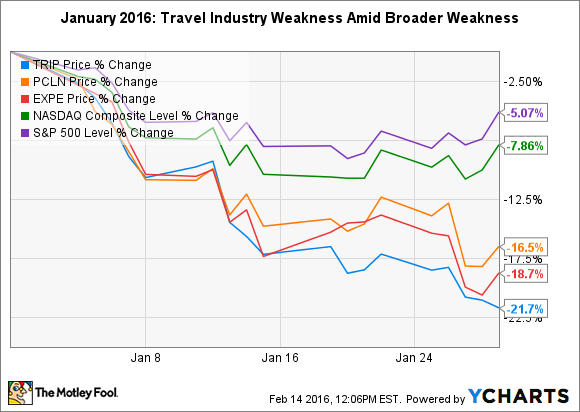 The online travel community yielded to sector pressures, but may have found at least temporary relief from its stock price weakness. Orange County Resorts Kabini, in India's Nagarhole National Park, one of TripAdvisor's top 25 hotel destinations for 2016. Image source: TripAdvisor. What: Online travel destination TripAdvisor's (NASDAQ:TRIP) stock fell 21.7% in January, according to data from S&P Global Market Intelligence . The slump more than erased the company's 14.2% price gain in 2015. So what: TripAdvisor found itself subject to valuation pressures experienced by many growth companies during January, as the S&P 500 Index lost nearly 5%, and the Nasdaq Composite Index declined nearly 8%. Sector vulnerability hit TripAdvisor as well. When markets begin to retreat due to fears over slowing economic growth -- as seems to be the current case -- online travel industry corporations often are subject to initial selling pressure. This is due to the reasoning, correct or not, that economic deceleration crimps consumers' disposable income, leading to reduced leisure (if not business) travel. As you undoubtedly noticed, TripAdvisor fell a few percentage points beyond peers like Priceline Group Inc. (NASDAQ:BKNG) and Expedia Inc.(NASDAQ:EXPE). That's because the company for some time has enjoyed a premium valuation relative to competitors, as seen in its forward price-to-earnings, or P/E, ratio. Much of the difference in the way investors value TripAdvisor stems from its ability to accelerate revenue on the strength of its ever-growing online travel member community. From 2013 to 2015, TripAdvisor posted a compounded annual growth rate, or CAGR, of 25.6%. In 2015, growth downshifted a bit, but the company still achieved a year-over year revenue growth rate of approximately 20%. In comparison, Priceline, which reports full-year earnings this week, managed growth at just half that pace -- roughly 10% -- in the first nine months of 2015. Expedia, which recently released full-year 2015 results, scaled revenue by 15.8% last year. For all its benefits, a burgeoning top line can punish as well as promote. 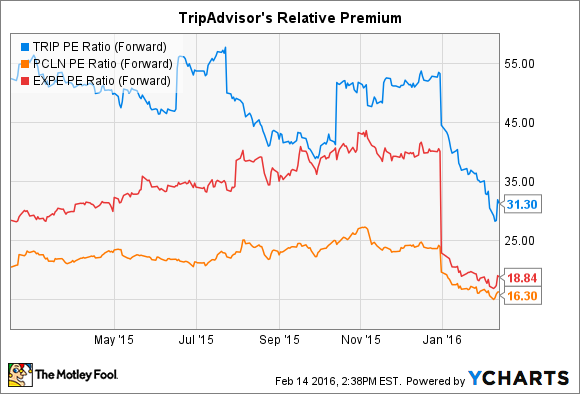 In November of last year, TripAdvisor lowered its full-year 2015 revenue growth rate guidance down to the high teens. The outlook exacerbated uncertainty in January, ahead of the company's Q4 and full-year 2015 earnings release last week, on Feb. 11. Now what: Apparently, shareholders needn't have worried too much. Revenue for 2015, as pointed out above, came in above the lowered guidance, to land at a growth rate of 20%. Earnings for the quarter pointed to the strength of the company's Instant Booking feature. Instant Booking has certainly challenged the organization -- new CFO Ernst Teunissen reported on the earnings call that the accelerated 2015 rollout of this feature negatively affected Q4 2015 revenue by $9 million. It also decreased Q4 earnings before interest, taxes, depreciation, and amortization, or EBITDA, by $6 million. Yet the service holds a great deal of promise for TripAdvisor long term. Instant Booking's partnership with Priceline announced late last year, gives TripAdvisor an extended reach in the online travel marketplace. Investors seem to recognize that the platform has substantial monetization potential over the next several years. The Feb. 11 earnings report stopped another 20% plus decline of the stock during the current month. Having reversed its trajectory, TripAdvisor stock is now down about 10% in February, which, if not a perfect outcome, at least offers the potential for a share price rebound in the making.